Within its glorious setting, the Spa at Mont Rochelle is conveniently positioned among the hotel’s luxurious accommodation. 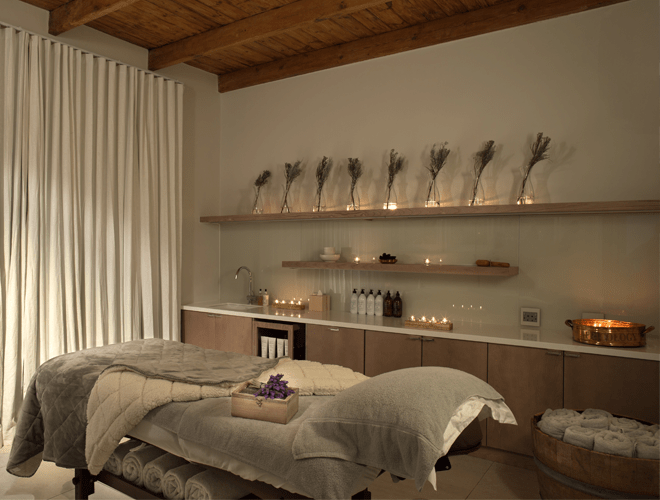 Mont Rochelle has two dedicated spa treatment rooms as well as a Hammam. We use the eco-friendly Africology ‘Authentic’ range of products which are made from 100% essential oils and natural plant extracts.Africology’s ethical skin care products capture the rejuvenating and healing essences of Africa, helping to revitalize the skin as well as prevent damage and premature ageing. Africology prides itself on its roots, taking inspiration from home and using local active ingredients including Rooibos, Aloe, Marula and African Potato. The entire range is suitable for vegans, is not tested on animals and is free from harmful chemicals and perfumes. The brand’s empowerment philosophy is also apparent in its approach to social responsibility. Africology only practices fair trade. The Spa at Mont Rochelle has a full-service spa menu, consisting of relaxing massages, hand and foot treatments ,body wraps, waxing and facials. Our fully qualified therapist can also assist you in selecting a specific treatment that will suit your personal needs. Day visitors are welcome to book treatments at the Spa at Mont Rochelle Spa, and may wish to make a day of it, rounding off the pampering with a delicious lunch at one of the two superb restaurants here – or even a country style picnic savoured in one of many breath-taking picnic spots on the farm.